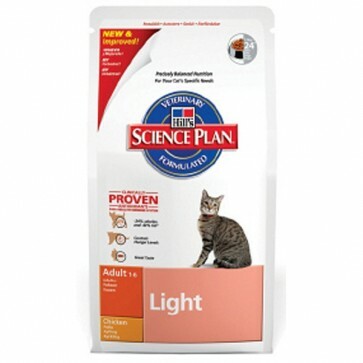 Hills Science Plan Feline Light Cat Food - Free Delivery Deal! Buy 20kg of Hills Science Plan Feline Light Cat Food, Any Variety And Get Free UK Mainland Delivery!! Hills Science Plan Light Cat Food is a nutritionally complete food, specifically formulated for adult cats who need a food with fewer calories and less fat to help them maintain a healthy weight. Some adult cats may gain weight as their activity levels reduce, due to old age or neutering, hills science plan light cat food contains 24% less calories and 60% less fat than hills adult varieties, to allow you to control your cat's weight more effectively! Excess body weight is associated with many avoidable health problems if your cat's weight is controlled, including placing a strain on your cat's bones, muscles, joints and internal organs, including the heart. Hills Science Plan Feline Light is suitable for all adult cats with a tendency to gain weight easily, from 1 to 6 years of age and contains high levels of fibre to control hunger, by giving your cat the sensation of being full, without consuming too many calories! Just like the hills science plan adult varieties, the light food is low in both magnesium and phosphorous to help protect your cat's urinary tract and to maintain healthy functioning kidneys, by controlling the level of phosphorus in the cat food. The light recipe is available in two tasty flavours, chicken and tuna in economical 5kg and 10kg bags. Regardless of the lifestage variety you feed, all feline hills science plan recipes contain beneficial natural supplements, for instance Omega 3 & 6 fatty acids to promote a healthly skin and glossy coat, with added taurine to help your obese or over weight cat maintain a normal heart function. Hills science plan light cat food also contains L-Carnitine a naturally occurring amino acid which helps convert excess fat to energy, to allow your cat to maintain a lean body mass. Like all hills feline science plan foods the light recipe will provide your cat with the correct balance of energy, protein, essential vitamins and minerals, with a unique antioxidant formula to boost your cat's immune system, reduce cell damage, aid growth and give them extra protection against diseases. The crunchy texture of the light cat biscuits, will also help improve your cat's dental health, by scraping away at plaque, reduce tartar build up and improve bad breath by removing food deposits around the teeth, left by soft foods and treats, when you cat munches on the biscuits! Lastly like all feline science plan foods, including the light tuna and chicken varieties, do not contain any artificial colours, flavours or preservatives and no unwanted fillers used to cheaply add bulk to cat food or animal derivatives that can cause food related sensitivities or allergies!